Go to the official Udyog Aadhar Registration portal where you will find the very first step for getting your business registered online. Aadhaar Number: Requreid 12 digit Aadhaar number issued to the applicant in the appropriate field. Name of Applicant: Fill name of Applicant as mentioned on the Aadhaar Card. Social Category: Select the Social Category of applicant from the given options. Name of Enterprise / Business: Fill the name of Business / Enterprise which will get printed on MSME Certificate. Type of Organization: Select the type of organization from the given options which will get printed on MSME Certificate. The Applicant may select from the given list the appropriate type of the organization for his/her enterprise. The Applicant must ensure that he/she is authorized by the legal entity (i.e. 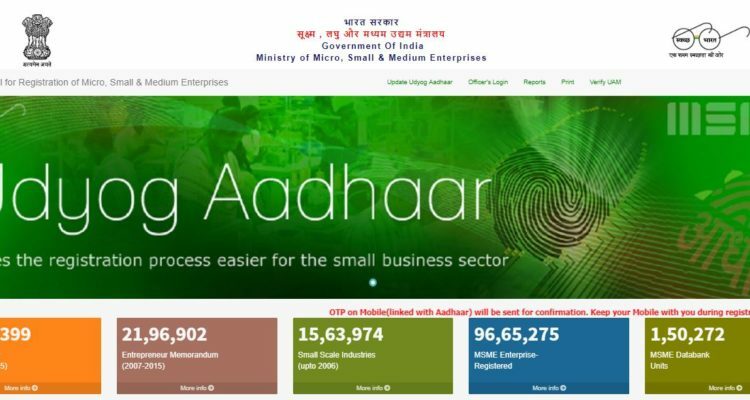 enterprise being registered for Udyog Aadhaar) to fill this online form. Only one Udyog Aadhaar number shall be issued for each enterprise. Date of Commencement of Business: Fill the date of Commencement of Business which will get printed on MSME Certificate. Bank Details- Bank Account Number: Fill the Applicant’s bank account number. Bank IFS Code: Fill the Applicant Bank IFS Code. The IFS code is printed on the Cheque Books. The Applicant must provide his/her bank account number used for running the Enterprise in the appropriate place. The Applicant must also provide the IFS Code of the bank's branch where his/her mentioned account exists. The IFS code is now a days printed on the Cheque Books issued by the bank. Alternatively, if the Applicant knows the name of the Bank and the branch where his/her account is there, the IFSC code can be found from website of the respective Bank. Main Business Activity of Enterprise: Select the Main Business activity from the given options. NIC 2 Digit Code: Select the 2 Digit NIC Code from the given options considering your business activity. Number of employees: Fill total number of people been employed. Investment in Plant & Machinery / Equipment: Fill the total investment made in Plant, Machinery, and Equipment etc. to start your business. lnvestment in Plant & Machinery / Equipment- While computing the total investment , the original investment ( purchase value of items) is to be taken into account excluding tho cost of pollution control, research and development, industrial safety devices, and such other items as may be specified, by notification of RBI. If an enterprise started with a set of plant and machinery purchased in 2008 worth Rs. 70.00 lakh has procured additional plant and machinery in the year 2013 worth Rs. 65.00 lakh, then the total investment in Plant & Machinery may be treated as Rs. 135.00 lakh. Best Institute of Share Market Courses, Classes and Training is an ICFM (Institute Of Career In Financial Market). We provide most simplified Stock Market Course like CPT, CFMP, CTIM and CAT. These courses Gives you the full knowledge about the Share Market. Get more information about starting a career in the stock market call now - 8669865575. Thanks for sharing the blog and this great information which is definitely going to help us. ICFM (Institute Of Career In Financial Market) gives you basic and advanced Share Market Courses and Stock Trading Training. We have provided the complete knowledge of share market through unique courses like CPT, CFMP, CTIM and CAT. Get more information about starting a career in the stock market call now - 8669865575. I read this article and it is very useful. It gave me all the information about the topic. I specially like the way you explain everything in just couple of lines. Thanks for sharing the information. Such a more valuable information. I also read your all Blogs. This is awesome!! I’ve always enjoyed reading that type of blog. Keep writing such kind of info on the page. I am really impressed with this type of writing. Thanks for sharing with us. Campus-Abroads mission is to impart high quality counselling to students seeking overseas education, guiding them to the appropriate course atrecognised universities. Beginnings the sole presence in the untapped realm of overseas education in India, Campus-Abroad has since grown to a global network of affiliates and universities. At Campus-Abroad, We have guided over our students - drawn from every strata of Indian society to viable study options across the globe. Campus-Abroads mission is to impart high quality counselling to studentsseeking overseas education, guiding them to the appropriate course atrecognised universities. Beginningas the sole presence in the untapped realm of overseas education in India, Campus-Abroad has since grown to a global network of affiliates and universities. At Campus-Abroad, We have guided over our students - drawn from every strata of Indian society to viable study options across the globe.